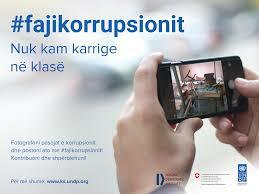 UNDP Kosovo has launched the “#becauseofcorruption“ (#fajikorrupsionit or #zbogkorupsije) competition, in which everyone is invited to show the damaging effects of corruption in their daily lives by using photos as a means of communication. To be part of the competition, there are two simple steps: (1) Take a photo of the damaging effect of corruption (example: lack of chairs in classroom, old equipment in hospitals, trash on the streets or any other), (2) Post it online on Facebook/Twitter/Instagram with the #becauseofcorruption (or #fajikorrupsionit or #zbogkorupsije) and all are part of the competition. The photos will be evaluated by a professional panel and top three photos will be rewarded with cash prizes. The top 20 photos will be part of an exhibition which will be held on 9 December, 2015, to mark the International Anti-Corruption Day. These photos will then be framed and sent to different local and international institutions, as a symbol and a reminder of the citizens’ perspective on the damaging effects that corruption has on the society. This competition, that is open to everyone, will be open until 4 December and is part of an ongoing set of activities organized by UNDP’s Support to Anti-Corruption Efforts in Kosovo project, in cooperation with Kosovo Democratic Institute – KDI. Click here for terms and conditions of competition.